How would you feel if your son had died trying to save the world and his best friends never told you? Chrono Trigger is one of the most famous video games ever made. You’d be hard pressed to find a top 100 list that doesn’t include it, and when it comes to the SNES’s library in particular, it has few (if any) true rivals. But while people like to praise the game’s beautiful sprites and unmatched soundtrack, its sleek, turn-based battle system and bonkers time-traveling story, they rarely dive deep into the game’s more granular side-narratives, let alone touch on the game’s truly weird hangup about moms. Let’s start with the spiky-haired titular character. 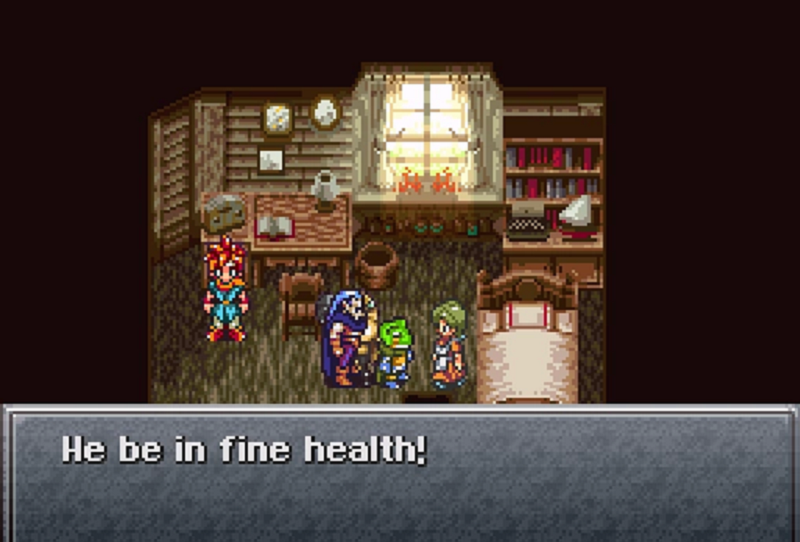 Crono’s mom’s wake-up call is the first thing you see when the game starts. She comments on the beautiful sound of the bell ringing from the town square and tells you to stay out of trouble before going downstairs to take care of things around the house. You’re supposed to come back before dinner, but of course you never do, getting caught in a weird portal that transports you through time and sets you on a course to try and prevent an eventual apocalypse. Every time you return to Crono’s house over the course of the adventure his mom will comment on whatever new friend he’s brought back. Upon seeing Frog she tells her son to keep his pets outside, while Ayla’s skimpy animal furs leave her scandalized. Ayla, unfazed however, simply responds “Crono strong...Crono mother strong, too!” It’s endearing and one of the details that made the game so memorable when others in the genre were content to have NPCs recycle the same stilted lines no matter how many times you chatted with them. After Crono dies during the encounter at the Undersea Palace, the game tasks you with retrieving a doll from his house in order to try and revive the fallen hero. But there his mom is, cleaning his bedroom, completely ignorant of her son’s demise. The game’s saddest track starts up and when she asks about Crono you lie and tell her he’s doing just fine. “Tell him to be good, alright?” she responds. Then you grab the doll and head out. It’s awkward and heart breaking and beautifully unresolved. You can beat the game without bringing him back to life after all, and where modern games might be prone to protracted, fully voice acted melodramatic scenes, Chrono Trigger was content to just let the situation breathe in the background of everything else going on. No one ever mention’s Crono’s dad either, giving his single working mom the depth that comes with stoic resignation. The character seems sad. Wouldn’t you be if your only son went off and got himself killed and never came back home for dinner like you asked? 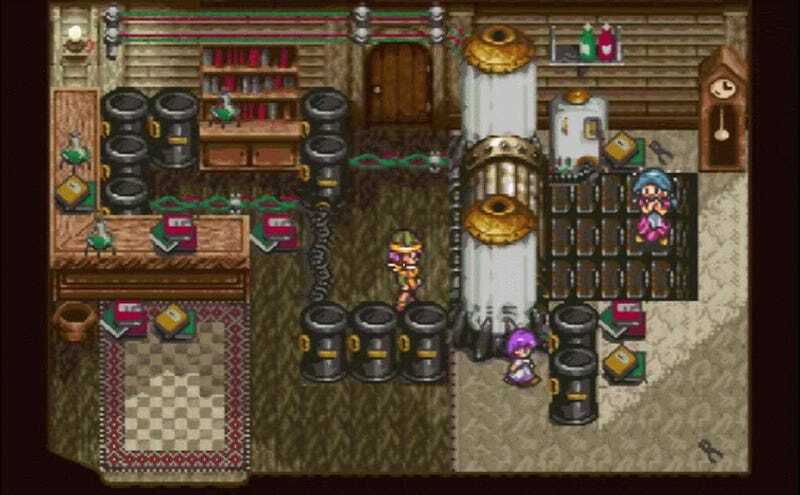 Even when the world is eventually saved, Crono still takes off just like at the start, with the game completing her portrait as someone who is either deeply oblivious or is simply forced miss her son in silence. In one of the game’s many endings she even slips into a time portal, lost to eternity forcing Crono and Marla to search for her. Moms, amiright??? And then there’s Lucca’s mother, who’s clumsiness leads her dress to get caught in some of her husband’s machinery and loses her legs as a result. Lucca was too small at the time to do anything, leading to the setup of the game’s most in-depth and easy to miss side quest wherein she goes back in time and tries to prevent the tragedy. In one of the earliest quick time events in a game I can remember, Lucca has to input the correct password to shut it down. As you search frantically to discover the correct password, which turns out to be the mother’s name, Lara, the conveyor belt she’s stuck to carries her closer and closer to a potentially brutal end. But the game never tells you how to input the password. If you don’t guess quick enough that you can do it with the SNES controller’s own alphabetic buttons (L A R A) history repeats itself and Lucca goes on blaming herself for the tragedy. It’s one of the game’s most interesting side quests in part because of how indifferent it seems to the outcome. It’s willing to let you fail in a way, and apparently according to the pre-release version of the game, the accident was originally intended to be unpreventable, and instead provoke questions about the nature of time and its consequences. That’s right, there was a version of Chrono Trigger that didn’t just subject Lucca’s mom to a crippling accident once, but in every possible timeline. There’s also Robo’s spiritual parent, Mother Brain, a super computer intelligence that runs the post-human world after Lavos has destroyed it. Throughout the game Robo is pressured to leave his friends behind and rejoin the collective of machines who created him. At least in the American translation of the game, Mother Brain implies her ruthless reproduction of machines without agency is necessary to try and defeat Lavos and stop the alien entity from spreading to other planets. Originally created to oversee the biodomes that house the game’s futuristic human population, her agenda is at least understandable even if it ultimately puts her on a collision course with the surviving remnants of humanity. But since Chrono Trigger is weirdly ruthless with its motherly characters, there’s no way to try and make peace with her so people and the technology they created can once again work together and go about fixing the planet. Instead, your only option is to destroy her (the factory she controls is, after all, processing humans like livestock), but not before the game also asks Robo to destroy his former love interest, a robot named Astropos who was re-programmed by Mother Brain to forget her past relationship. This game did not pull its punches. Finally, who could forget Magus’s mother, Queen Zeal, the power hungry magician who has a machine created that will allow her to harness Lavos’ power for her own ends. Her ambition drives the floating kingdom in the sky to eventual ruin and also leads Magus to become one of the most notorious villains in the history of video games when the loss of his sister drives him into despair. Tossed into a time portal because of his mother’s power trip, the fledgling magic user is raised by monsters who encourage his nihilistic outlook. And because the events in the game allow him to eventually go back in time as well, he has to witness his mother’s descent into madness not once but twice, finding himself powerless to stop it in both instances. But unlike Lucca, there’s no later side quest where you can help Magus undue the toll time has taken on his family. Instead, he’s forced to confront his mother atop the Black Omen towards the game’s end and kill her, left to search for his sister Schala in vain forever after. At least Frog gets to turn back into a human at some point. For Magus, there’s nothing even resembling redemption. Few games have been so cruel when it comes to mothers.